"Personally, I dislike a made-up look. I never wear mascara unless my screen work demands it. 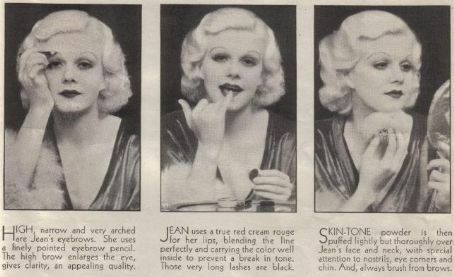 I use only powder and lipstick." "I believe too much make-up is bad for women who prefer a healthy, natural complexion. Every woman knows what make-up she desires, and she should deal with it judiciously." "Of course, we use different make-up for our screen work than we do in our personal lives. The same thing applies to clothes. Clothes and make-up are always a part of characterization. You must adapt yourself to the character you are portraying on the screen. That is the reason they call us actresses and actors." "There are no tricks to the care of my hair at all. I use castile soap and shampoo it like everyone else might do. I never use a rinse. I shampoo it every four days, but I rub hot castor oil into my scalp before every shampoo." "Do the studio lights damage it? Well, they dry it. Also, I'm always getting powder in my hair from my make-up. I never wear a hat, you know, and the sun burns my hair and turns it yellow. I don't mind that because I hate hats." Very interesting snippets to read! I always love hearing what people actually did in their daily routines. love it!! Thanks for sharing her tips and quotes! Glad to hear you all enjoyed the post!